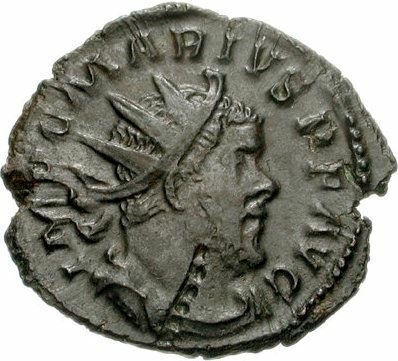 Marcus Aurelius Marius was briefly emperor of the Gallic Empire in 269 following the death of Postumus. According to tradition, he was a blacksmith by trade, and rose through the ranks of the Roman army to become an officer. He was present with the army that revolted at Moguntiacum (Mainz) after the emperor Postumus refused to allow it to sack the city. After murdering the emperor the army elected Marius to succeed Postumus. According to the ancient written sources, Marius’ reign lasted for two or three days only, before being killed by a sword of his own manufacture. This tradition is probably partially or entirely incorrect. Based upon the number of coins he issued, a more accurate length for his reign would be at least two or three months.